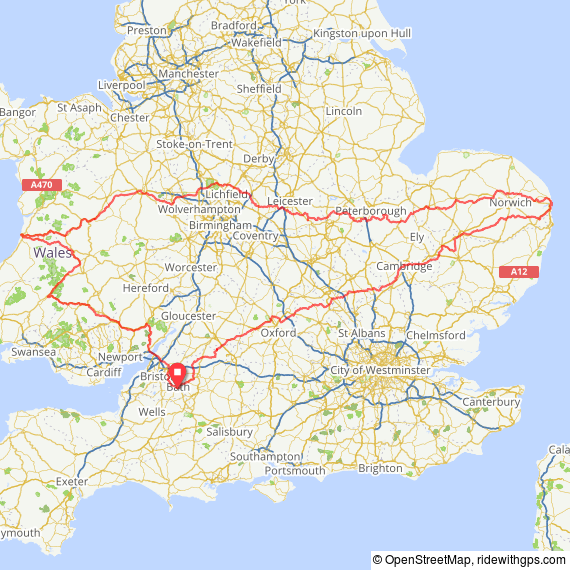 It’s been a few months since I blogged about my plan to ride an alternative end to end (e2e) from Dover to Cape Wrath during June 2019. I now know a lot more about my actual route and the logistics of how I will get to and from my start and finish points. Also each of my 7x200km DIY audax routes are in place, plus where I will stay each night. The route also includes 2 ferries so that adds a bit of spice and a bit of uncertainty, so I have had to give that some extra consideration. In fact the final leg also crosses military firing ranges which can and do get closed to the public at times. Lastly, I will share a motivation tip from one of the leading thinkers in behavioural science and how I use this hack to keep incentivised and focused on the goals I set myself. So the route planning came first and I use Strava as the initial resource to plan my routes. This is because I find Strava the easiest mapping software to use for the early stages in my route planning. For instance, I can just create a route by tapping in a postcode, zooming in, clicking on the location and then clicking on a finish point and within seconds it will construct a route for me. This calculates by using roads that cyclists most use and I think of this as tapping into an open source of many years of local experience & expertise, at the click of a mouse. Just as I know my own area very well, the route that comes up is based on similar local knowledge. This method provides an exact distance too, and if it is a bit short or long you can simply drag and drop out to get the required amount of miles/kilometres. Once I was happy that the routes were at least 200km each I transferred each 200km route file over to another route mapping site. Ride with GPS (RWGPS). The benefit of this second site is you can drag and drop the orange ‘peg man’ over the route to check streetviews and ensure that you are not being sent off road or across fields that may suit mountain bikes but not road bikes. When you zoom in your route will be highlighed and as you trace the ‘peg man’ across your route any off road sections where the mapping camera car has not travelled display as ‘No Data Available’. RWGPS is much easier to make any minor adjustments on when necessary as in edit mode you can isolate a stretch of route by adding ‘control points’ so the remainder of the route is not affected. As a precaution I always edit a ‘copy’ version of the route just in case I do mess it up. This ensures I have the original un-edited version as a backup. What really surprised me as I did each of the 7x200km routes is they all ended up in areas with either a Travelodge, Premier Inn or Youth Hostel. Frankly, I was gobsmacked by this! So the 7x200km routes will take me from Dover Premier Inn to Durness Youth Hostel on the north coast of Scotland, where I will stay 2 nights. On Day 8 I plan to take a short ride to the ferry across the Kyle of Durness and then ride across the ranges up to Cape Wrath. The ferry company provide a mini bus service but I prefer to ride. I have ridden this road before and it is very rutted and bumpy. When I get to Cape Wrath if there is pressure to get back for the return ferry to Durness I may try and blag a lift back. The Kyle of Durness ferry has tidal restrictions so I don’t want to get stranded. As I say I have done this both ways before so I know it is feasible. There is also a short river crossing ferry on Day One from Gravesend to Tilbury. This is more commuter based & therefore less likely to cause me a problem. It is a Monday to Saturday service so the only real issue for me was: Don’t start my e2e ride on a Sunday! As you can see the ride from the ferry up to Cape Wrath crosses a firing range so that also adds uncertainty. As well as tidal restrictions the ferry also gets cancelled in bad weather. I will only be there one day so only get one shot at this (excuse the pun!) So as a get out of jail card I can still complete an e2e even if I only make it to Durness, although Cape Wrath still remains my goal and I will give it a lot of effort to achieve this. Day 9 is another 200km DIY audax retracing my route back to Inverness Youth Hostel, then a flight back to Bristol the following day. I had planned to stay at Alnwick Youth Hostel but as of early April they are not taking bookings after May 15th. This led me to seek out a Bed and Breakfast nearby which I have now booked. Next up was transportation to my start and back from my finish points. Train fares were prohibitively expensive. Bath to Dover was £76 and Inverness to Bristol Parkway was £244. So I sought alternative options and have come up with Bath to Dover on National Express Coach for £13 and Inverness to Bristol Airport for £67.30, which includes a £41 bike fee. I have a lightweight foldable rucksack to put the bike bag in for the ride back to Bath. This saving over the train fares covers well over 75% of my accommodation costs so was well worth investigating. Another benefit of not using trains is the guarantee of a seat. Coaches & airplanes will not allow you on board without a seat reservation. I got the idea of taking my bike on a coach after travelling to Paris Brest Paris in 2015 with Audax Club Bristol. They hired a local coach company who organised all the travel and accommodation. They said if need be they would remove seats on the coach to accommodate our bikes but asked us to box them and leave them with the company the day before to work out how they would fit everything on board. The day of the departure I was amazed at how much space is underneath a coach and all our bikes and baggage fitted in this space with plenty of room to spare. So I searched online for any information about taking bikes on National Express coaches and got a few vague references but nothing really detailed. So I figured, just run an experiment and see what happens! So in December I booked a coach from Bath to Chippenham 14 miles away and bagged my bike up and took it on the coach with no problems. Once I got to Chippenham I went to a nearby WH Smiths and sent my bike bag back to my house via DHL. It arrived the next day. I made a video of this trip. My plan then, is when I arrive at Dover I will reassemble my bike, fold my bike bag and go to a nearby WH Smiths and send the bag via DHL to Inverness Youth Hostel so it is waiting for me on Day 9. A condition to taking my bike on the easyJet flight is it must be bagged or boxed. So hopefully I have thought this all out, but I do have a couple of contingency ideas just in case! Preparation over the winter was riding 200km DIY’s to Youth Hostels, staying overnight and riding back the next day. During January I was inspired by Kelly Holmes, who is a hero of mine, to take part in RED January. This is to encourage people to Run (or Ride) Every Day during the month of January. I did a Run or Ride every day and the overnights were part of this. I also ran for the first time in about 10 years. I did have to rely on a turbo trainer some days due to other commitments. By the end of the month I felt fantastic and believe this has really paid off. It was a nice way to make a worthwhile charity donation too. I wound up the Youth Hostel rides at the end of February by riding 3x200km over 4 days. It was a chance to test myself a bit and see how I would cope with some back to back days. I definitely needed the one day off. But for so early in the year I am really pleased with how well my commitment is going. In March I have been riding 300km DIY’s and although the first one was quite hard I soon adapted to the increase in distance. I am already thinking about my first 400km of the year by the end of April and a 600km in May. My aim is to incrementally increase the distances as I do each year and then to taper off in early June so the 200km distances seem relatively and psychologically easier to cope with. It took me years to work out that relativity is all about comparing one thing or one perspective in relation to another. Below are 2 orange dots exactly the same size. But look what happens when you compare them to other perpectives or relative reference points. The 2 orange dots are still exactly equal in size. Get the idea? During the month leading up to my e2e I aim to replicate what I learned from RED January. Although I have ridden the 1400km distance twice before, I believe the big challenge of this goal will be the starting out each day as a new ride. As the fatigue accrues during the trip I suspect this will be as mentally hard as riding 1400km as a single ride. Just in a different way. While I was at grown up school I remember being in a tutorial once learning about behavioural finance and I recall thinking, “blimey, I wonder if I could use these ideas in sport?” I began to read up on sports psychology and the more I learned the more it dawned on me these disciplines were very similar. I began to interchange some of the ideas and experiment using them. One of the hacks I use to keep myself motivated sounds remarkably simple but I have found is incredibly effective. It is based on an incentives technique by Robert Cialdini who describes in this interview how you can also apply it to yourself. This is one I use quite often on day rides, on longer muti-day rides and also for a long term goal such as my Dover to Cape Wrath goal for 2019. I can only offer a personal perspective but for me, IT WORKS INCREDIBLY EFFECTIVELY. So early April and things are running smoothly and I am pleased with the planning so far and my commitment. It does not mean there won’t be alterations or even setbacks but so far things are going well and I am looking foward to the next steps towards my goal. Self-Calculation and Using a Timeline. These are without a doubt two of the most important things I have learned whilst riding DIY audax events. They came about after I rode a 1400km DIY from Bath to Lindisfarne and back in May 2016. 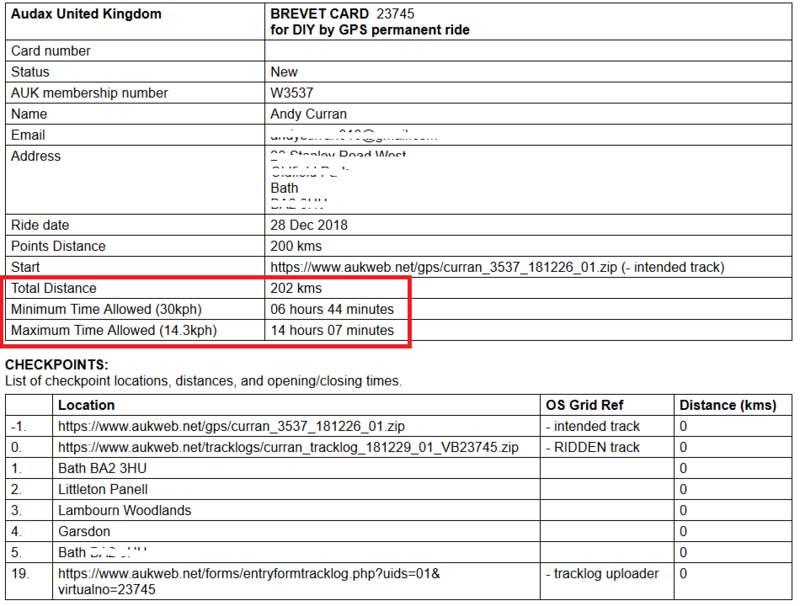 Up to then whenever I entered a DIY audax I blindly accepted the maximum time allowance listed on the virtual brevet. The problem is: the auto-calculator is sometimes wrong! I found this out the hard way on the Lindisfarne 1400 when I wrongly believed that I only had 98 hours maximum to complete the ride. In fact I actually had over 116 hours but only found that out after I finished thinking I had run out of time. Since then I also benefit from using a Timeline to aid me during the planning stage and also when I am riding the event itself. So lets start at the beginning and explain that a DIY audax is a permanent event that you can ride at any time pretty much anywhere you want once your proposed route has been accepted by the regional events organiser. I had already successfully completed quite a few DIY’s of distances from 200km up to 600km. I planned this 1400km over the winter of 2015/16 and was advised by Tony, our helpful and friendly regional organiser, how he wished me to submit a non standard distance on the entry form. All went as he suggested and I got my ‘virtual’ brevet as usual. The ‘virtual’ brevet lists the official requirements of your ride such as rider details including name, address and membership number. It also includes the route details you have submitted such as date of ride, distance of ride and control points you will pass through. Just as on a ‘physical’ brevet card you carry on a calendar event. What is different about the virtual brevet is that you never touch it, it is an electronically held record and it includes a ‘zipped’ (electronically minimised) .gpx file of the route you intend to ride. Here is a copy of a virtual brevet from a recent 200km I rode. As you can see the virtual brevet lists details in 2 main boxes. This is a closer view of that highlighted box. Note that the total distance needs to be at least the ‘Points Distance’ but is often slightly more. 202kms in this instance. What I had completely forgotten to take into account were the lower minimum speeds required for the longer distances, not catered for on the drop down menu on the entry form. This had an exponential effect on the Maximum Time Allowed for my 1400km DIY. As it had never been an issue until then, I simply did not give it any thought. I just always accepted the time allowances the virtual brevet auto-calcuates based on each submitted distance. In effect it is a spreadsheet. It was only on the third evening of the 1400km somewhere in Yorkshire that I realised I was struggling to keep up with a schedule I had set myself based on 98 hours. I had built up a 20 hour time buffer after the first day but had hit a bad headwind on the second day and surrendered a substantial chunk of that surplus. On day three I crossed the Yorkshire Dales and had four really hard summits to cross. By that evening I was beginning to have serious doubts about my progress. What compounded the issue was accumulating fatigue rapidly slowing my thought processes and I was struggling to figure out what the problem was. I recall thinking that the time allowance was either wrong or that I was simply no longer able to ride a 1400km audax ride at the required speed. A quick mental calculation seemed to suggest the time allowance of 98 hours was roughly correct. I arrived at this by figuring that the Paris-Brest-Paris (PBP) 1200km randonneur time allowance was 84 hours maximum and add on another 200km at 14 hours and together that would total 98 hours. BUT, I also knew that PBP had a maximum time allowance for the tourist group of 90 hours and I also remembered people saying on the London-Edinburgh-London 1400km I had ridden in 2005 that the longer distance meant a slower average speed requirement which translated into longer optional sleep periods. OR was it that I was now older and just too slow? I have a vivid memory of stopping at a petrol station for coffee as it got dark and trying to do the maths on my phone calculator. I had always switched off mentally when people went into the detail of all the different ride abbreviations such BP, RM, BRM, etc. as it simply bored me. I now cursed myself for not taking more notice. I made a decison that I would finish the distance no matter what, even if it meant finishing outside the time allowance and a failed brevet attempt. So I eventually finished in 108 hours and 27 minutes. I got home and out of courtesy more than anything I submitted my gps. ride file to Tony Hull, the organiser and explained that I had run out of time. I went to sleep for about 6 hours and awoke to a lovely email from Tony explaining that I had in fact succeeded as the correct time allowance was 116 hours. I had even finished with over 8 hours to spare! Tony realised that the DIY auto-calculator had not taken the non-standard distance into account. I felt a bit stupid but quickly decided to learn from my own mistake. It always pays to own your own mistakes and use them as learning opportunities. I made a film of that ride as my first attempt at vlogging. A bit cringeworthy but I guess it tells the story! By doing a websearch for Audax time allowances a page like this will appear and you will find a PDF of Audax Regulations and Appendices as shown below. In section 9.7.1 of this PDF you will find the speed requirements for each of the distance bands as shown below. In the case of my 1400km DIY you can clearly see that it fits into the 1300 to 1899km band which requires a minumum speed of 12kph. The formula for the maximum time allowance will be: (distance ÷ speed = time). So using my 1402km total distance divided by 12kph, I get 116.83333 hours. Bingo! Next you need to convert the decimal fraction of an hour into minutes and the formula for this is: (decimal fraction x 60 = minutes) as there are 60 minutes in one complete hour. Therefore: 0.83333 times 60 is 49.9998 and you would round that up to 50 minutes. So on my 1400km Lindisfarne ride I actually had a time allowance of 116 hours and 50 minutes. So all my planning and accommodation booking were out by 18 hours and 50 minutes because the minimum speed required was 12kph and not 14.3kph, all because I had used the DIY entry form in an unconventional way just to enter a non-standard distance. Imagine an airliner on the runway but just a couple of degrees off being centrally lined up as it accelerates. Instead of taking off it would probably end up in a field! Well the Yorkshire experience was like me realising I was heading off a runway. By Oxfordshire the following night I had come off that metaphorical runway, when I was forced to sleep in a church porch for several hours due to complete exhaustion. So the major lesson learned was that when you are experimenting and pushing the boundaries do not automatically rely on technology as it was not designed with this in mind. After all the ethos of Audax is self-sufficiency and DIY stands for Do It Yourself. Being able to self motivate gives you a terrific advantage. I view a timeline as punching a hole in the present and using it to look at a point into the future. You can then work backwards using staging posts or markers. A bit like a sniper identifying a distant target and clearly focussing in on it along a sightline. Then lining up a rifle by using sights directly in front of the eye and at the end of the barrel with the target. The distant target becomes fuzzy….but it is still very much there. So taking my 1400km DIY as an example you can now project 116 hours and 50 minutes into the future and plot it onto a timeline. In my case I use a calendar to calculate what time of what day I will start to find out the cut off time. I started my 1400km DIY at 05:00 on a Monday so that meant I had until 01:50 Saturday. That is 4 complete days plus 20 hours and 50 minutes. I can now begin to break this down into days and nights. In my case I am quite comfortable riding 300km a day, plus about another 10% at my pace. Much more than that and in my case I suffer from sleep deprivation. So I will try and plan my stops accordingly. That may mean trying to book accommodation around the 330km mark or just deciding that is when I am most likely to tire and be thinking about looking for a bivvy location leading up to that point. I cannot stress enough how much this knowledge helps. When I tire I am actually prepared for it and better able to cope with it since adopting this strategy. Some refer to this as a pre-mortem approach. Instead of identifying a problem after it has happened, you recognise the probability of it beforehand and so prepare for it. Its like the difference between a check up and an autopsy! This is empowering in such a positive way, especially when tiredness would otherwise be an obstacle to thinking a problem through. Another benefit of a timeline is you can mentally super impose it over a clockface during the ride itself. In my case I find this really useful as when I tire I find the mental arithmetic more and more difficult. The clockface is much easier to visualise and calculate on. Even on shorter 200 and 300km rides I practice this. Say for instance I ride a 200km ride and have a 14’07” time allowance and I start at 07:00. I now know that my cut off time is 7 minutes past 9 o’clock that night. The further I progress into a long ride the more I compare the Garmin estimated time remaining figure in hours & minutes to my clockface of actual time remaining to make calculations of how much ‘Real’ time I have in hand. On the longer rides this really does pay dividends when evaluating my progress and gauging how much sleep I can allow myself. I always try to keep a minimum of one hour in hand to allow for any late mechanical problems or to avoid getting stressed at traffic lights or other delays. This year, 2018 I rode a 1200km DIY between Bath-Great Yarmouth-Aberystwyth-Bath and finished with just 47 minutes in hand. The timeline saved me as I tired rapidly on the final day due to fatigue and lack of sleep. When I had entered this event I had no idea that I would have a 335 mile leg into a strong headwind. I was able to adapt on the road and re-calculate how to proceed on substantially less sleep than hoped for by using my timeline. Use time as a resource just as you would food or drink. Think of your time allowance as an asset that you can deploy strategically. NOT as a time limit which is a liability working against you. By slightly altering this frame of reference you can give yourself a massively beneficial psychological effect. It’s like a gaining superpower! As I got older and more experienced with pacing myself on long distance rides the mental aspect began to play a greater part as I became aware that due to age I could no longer physically push myself as intensely as when I was younger. As a mate once said, “Andy, you have to realise you are no longer 22.” At the time this was devastating, but gradually over time I realised that it was about coping with change. So I thought I would share some of the strategies I use for when times get tough. Alongside them I will share some personal examples of how I apply them. 1) Break large tasks down into smaller manageble chunks. Probably the mantra that most people are familiar with although often overlooked. The obvious way to apply this on audax calendar events is to stage your ride between controls. On DIY events which are what I mostly ride these days I had to find a different technique. Technology helps with this as the Garmin I use to navigate by and to log my rides has a progress bar along the top of the screen broken into quarters. A mentor once taught me to break any large task into four quarters. He said that during the first and second quarters are you are normally excited by the buzz of the event and by the progress you are making. He suggested that mental doubts often creep in during the third quarter, because fatigue and exhaustion are building up but you still have a long way to go. He went on to say that by the final quarter you can often get a lift because the finish is in sight. So, be aware that the third quarter could well be the most difficult and keep mental energy back to compensate for it. I have found this advice so useful in the 25 years since I first heard it. On multi-day rides I treat every day as a seperate ride in itself to stop myself becoming overwhelmed by the really long distances. Only as I approach the final leg do I begin to think about what I will have achieved. I use the distance of 300km as a kind of ‘anchor’ or internal reference point for each day. That distance is one I am comfortable with at my pace but know that much more than 10% over it and I will be struggling with sleep deprivation. Some riders can cope with no sleep on long rides whilst others of us simply can not. My favourite quote on the matter is when a reporter interviewed Steve Abraham about his Year Record attempt in 2015. Interviewer: How do you cope with sleep deprivation? Steve Abraham: I don’t. I sleep. By slightly altering the frame of reference you can significantly change your mindset. In my case as Audax is essentially a timed event over a set distance, I re-frame one of the main requirements and have found that it gives me an amazing advantage. I NEVER refer to a time limit. Instead I think of it as a Time Allowance. By doing this I turn a liability that is working against me into an asset that I now have control of. You don’t have to be an exceptional time manager and I think about time allowance as a type of budget. I then use money management skills to make sure I don’t run out of time in the same way as I make sure I dont run out of money during the month. To take the budgeting analogy further, just as I don’t blow all my cash in the first week after payday, neither do I expend all my energy in the early stage of a long distance ride. Instead I use self control to build up a bit of credit early on to cater for any uncertainties later on. A type of reassuring safety blanket. Another favourite way is to calibrate my Garmin to time remaining and distance to go. The time remaining really helps with time management as I can do some mental arithmetic and compare it to my actual time allowance to gauge how I am doing on the road. I visualise a clock face to help with the calculations when I am tired or if the numbers become a bit fuzzy. The distance to go provides a real mental boost as instead of mileage accumulating to large numbers they are in fact decreasing as I approach my destination. The task appears to be getting smaller as fatigue starts to build. I set little goals such as less than 100 miles to go, less than 100km to go, less than 50 miles to go and so on. The final 10,9,8,7,6, etc. miles always feels amazing as I home in on the finish. Blast off. It is said that achieving goals releases the neuro-chemical dopamine which some call a happy chemical. So it surely makes sense to set several intermediate goals to help motivate yourself during the long hours of an event. This has helped me a number of times over the years when I would otherwise have been struggling. While initially this may sound a bit pink & fluffy I have found it to be very effective at dealing with negative thoughts when they appear. I treat negative thoughts as just that: thoughts. Self talk is the dialogue that is constantly happening when we are thinking and can be turned around with a bit of effort. Without getting too technical, the amygdala or what is called the ‘fight or flight response’ inside us releases hormones such as cortisol at times of danger or stress. It is natures way of helping us survive dangerous situations but can also be triggered at times of emotional stress or anger. It is why I never engage in negative social media arguments! A 2002 neuro-science study found that when people use self talk to reassess upsetting situations, activity in their pre-frontal cortex (part of the brain that controls behaviour & decision making) increases in an amount correalated with a decrease in activity in their amygdala. In other words the study suggests that it is possible to regulate your emotions. Others argue that emotions are nothing more than ‘guesses’ your brain is constantly making and that you aren’t at the mercy of them. That you can literally re-wire your thoughts. You soon come to find that low patches dont last forever and often quickly pass. In fact the high points do not last forever either and this has made me really appreciate and really savour the moment. I have always been quite instinctive and found that most of my intuition and gut decision making seemed to stand me in good stead. In fact I would get irritated by those who were too analytical. I often thought they suffered from ‘Paralysis by Analysis’ and avoided too much contact with what I considered dithering types. That is, until I crashed and burned a few times (metaphorically not literally!) and those experiences really do teach you deep humility. So in my late 40’s I became an Open University student to try and learn how to be a bit more analytical (and humble). It was an eye opener and felt like pressing a reset button. I realised that being too skewed in one direction was like swimming with one hand tied behind your back. I swung more towards analysing situations and wanting to know WHY something worked or didn’t work rather than just taking results for granted. Nowadays I consider myself much more balanced in how I operate. It no longer feels like a violent tug-o-war between JFDI & caution. That by mitigating risk, the same level of reward becomes proportionately greater. I suppose I came to realise the goal is to find that magical sweet spot between risk aversion and over confidence. I do not claim to have mastered this by any stretch of the imagination but these strategies I have listed are a combination of personal experiences and applying learning to help find this balance. So those are a few of the things I have learned and the beauty is that you can transfer these skills to other aspects of you life. A list of free online courses I have taken since 2014. In 2015 I voluntarily dropped out of paid higher education. In 2018 my big cycling event was riding a 1200km DIY audax from Bath-Great Yarmouth-Aberystwyth-Bath. I made a series of YouTube videos about the event from initial planning to updates about training & preparation and then 3 videos about the ride itself. This trip started off quite easy with a beneficial tailwind on day one but then got steadily harder until I was unsure of whether I would finish within the time allowance of 90 hours. I eventually scraped in with just over 40 minutes to spare. I finished exhausted by sleep deprivation and fatigue which was mostly due to long sections of headwind in the middle third of the route. This slow progress meant I had to limit any stopping and ride through the last night without any sleep just to be in with a chance of completing on time. So, this blog series will be about how I manage fatigue and what I do to keep myself going when the going is hard. It is about what I have learnt through experience, through trial & error and how I have adopted the ideas of others and then adapted them to suit my own needs and to minimise the chances of quitting and giving up. I already have a big ride in mind for 2019 and this provides a perfect opportunity to use the planning and preparation to explain some of the techniques I use and how I have come to find what does and what does not work for me. Like all learning it is not definitive….it is work in progress. My plan for 2019 is to ride an End to End from Dover to Cape Wrath as 7 seperate 200km DIY by GPS audax rides back to back. Another main part of WHY is a thirst for adventure and exploring and an appetite for new experiences and powerful memories. Recognition in the form of medals, certificates, kudos or fast times are definitely not what motivate me. In 2019 I hope to avoid using a train or plane and plan to investigate taking my bike on a coach to the start point and then back from a convenient place somewhere in Scotland. Possibly Inverness ot even Glasgow. I need to research this more and plan to try a few practice trips over the winter, such as a coach to the start point of a 200km DIY somewhere. The map at the top of this post is what I came up with. I know for sure it will evolve and change over the coming months but I hope to keep a few basic ideas. Firstly the 200km’s will give me the logistics challenge of planning & preparation I enjoy without the need to ride myself into the ground as a 1400km could possibly do. However, there is the matter of starting 7 seperate events which could work against me. I have never done this many back to back audax days before even though I have done the total distace of 1400km a couple of times. Different pressures and definitely a step into the unknown for me. Next up, is accommodation. It is very unlikely that I will find Youth Hostels, Travelodges or Premier Inn’s at the stopover points along the route. Therefore I plan to investigate Airbnb for my accomodation needs. As with the coach transport experiment, I plan to do some trial trips over the winter using this type of accommodation at the end of 200km rides. To get a feel for it and discover if there are any problems with this approach. So, that is the goal I have set myself and it is still in the very early planning stages with much still to figure out. The next post will be about how I discovered this idea when I was a student and how it occured to me about a year later that I could possibly use it as a way to prevent myself quitting or ‘packing’ when things got really tough on long distance cycling events. The results turned out to be beyond my wildest expectations…. Soon after midnight on August 19th I arrived back home and had completed what I had set out to do last September. That was to ride a Super Randonneur Audax series for 12 consecutive months. Quick bit of video with me next to the kitchen clock to record moment then while my wife was sleeping I logged the ride onto Strava, to confirm I had accumulated the required distance, then I crept into bed. Not exactly a fanfare but actually it was just perfect. In both May & July I substituted 600 rides with 1400 and 1000km distances to make the most of the longer days and to satisfy my thirst for adventure. I had entered the inaugral Mille Pennine 1000km calendar ride on July 1st but life events elsewhere made me decide last minute to DIY my own 1000km from home. Bascially my heart just wasn’t in the MP and I honestly think I would probably been one of the many who did not finish. Of course I will never know for certain but a dose of honesty and gut instinct leads me to think I am right. The remainder of the July rides went smoothly and for August I decided to make some movies of the final four rides. I was really lucky to be joined by a couple of good mates for the 600 which not only helped enormously but made it one of the most enjoyable. In my original post from last September I wrote, “Most importantly for me is to learn from the experience by writing about my rides….” and that still remains the case. I gained a lot by setting myself a goal and working out how to go about achieving it. One of the big things for me was to use the informality of the DIY system to try different things out and take a few chances. A bit like friendly football matches really, try new ideas out and if they don’t work use it as a learning opportunity rather than seeing it as a failure. This was definitely the case with my 400km rides. Like many I found that distance the hardest due to tiredness impacting and feeling the pressure to continue without sleep. So I tried using the entire time allowance of 28 hours to build in long sleep stops after 300km then continuing for the final 100km giving myself about an hour in hand for contingency. These night time 100km circuits gave me some of the best ride experiences throughout the year. I then tried riding this distance as two separate 200km rides with a few hours rest at the halfway point. I also rode a non stop calendar event with friends. By August I was on a roll and decided to try and go for a non stop sub 20 hour 400km ride and managed it with 25 minutes to spare. It was a great way to finish my srrty. The other area which was important to me was motivation and using strategies I had picked up from other activities such as work and studying to apply to sport. I realised pretty soon into my srrty that I was in a kind of feedback loop where I was ping ponging day to day skills with my cycling activities and vice versa. I’m not qualified to teach so will not go into detail but can say that techniques that I learned studying business and finance fitted perfectly into my sport and funnily enough the reverse has happened. I’m now motivated to go on and finish the final two modules of my degree which I had deferred indefinitely due to lack of motivation! At 56 years old I took my gap year….funny old world isn’t it! I thought it may be a nice idea to try something a bit different so this month I will focus on two events that I referred to at the end of my May blog. Namely, a 1400km DIY from my home in Bath to Lindisfarne and back plus a new take on riding a 400km event. This 400km DIY was 2 times 200km circuits bolted together in a figure of 8 with my house as the start, finish and pivot point. Basically I wanted to see if riding 2 x 200 was any easier than 300 + 100 that I had found so beneficial over the winter months. On both these events things went right and things also went wrong so both were good learning opportunities. The 1400km Lindisfarne DIY came about over the winter when I was thinking of spring and summer 2016 events and trying to keep myself motivated on short dark days. I had been to Lindisfarne a couple of times previously, once cycle touring and once in a car and I wondered if I could create a 1200km ride based on another visit. A quick GoogleMap check suggested I would need to allow at least 1300km or possibly even 1400 to achieve this. What really fired my imagination though was the logistics of arriving at the halfway point within a certain time window to allow me to cross the tidal causeway onto Holy Island just off the Northumberland coast, the geographical location of Lindisfarne, which would almost certainly mean a night visit. The causeway would be open from 10.15 pm until 04.35am, just over a six hour time slot to manage to arrive within and then depart without getting marooned on the island and losing significant chunks of time waiting on tides, at around the 650km mark. In a nutshell I became hooked with taking on this time management challenge. So this door to door ride that just happened to have two Travelodges that appeared to be ideal stopover rest points all seemed to slot into place and felt very Zen. I contacted Tony, our fantastic regional DIY organiser and sought advice on how to go about entering this un-coventional distance DIY and he provided me, as usual, with superb help and advice. So, I set the departure date for Monday May 9th, 2016 and instantly made quite a huge mistake. As usual I referred to the maximum time allowance on the virtual brevet card of 98 hours and 4 minutes, which is based on the lowest average speed of 14.3 kph. What I failed to realise is that over the distance of 1000km the lowest average speed drops to 12kph and I actually had 116 hours to complete my ride. I take full responsibility for this oversight as not only had I had never read all the rules and regulations, I deliberately turned off whenever such matters arose in conversation and certainly never bothered to familiarise myself with the different categories of Audax rides such as BR, BRM, RM, etc. I did have a ‘gut feeling’ that 98 hours seemed rather ambitious but on the other hand a mental calculation that the Paris Brest Paris 1200 allows 84 hours at randonneur level and that 14 hours is the time allowance for a 200km ride which totals 98 hours. So in essence the maths seemed to add up and I told myself not to be such a wimp and just to get on with it and ride. Lesson learned the hard way, although this can often be the most effective way. Anyway, I decided that I would attempt my first video-blog, or vlog, during this ride to document my ride and although initially I felt very self conscious talking into my own hand held camera I did ‘sort of grow into it’ and felt more confident after a few days. Next up in May I rode a permanent version of The Rough Diamond 300km with a mate on what was a chilly and windy day. It was great to have company and much appreciated by me as I had one of those days where the physical side of the cycling just felt like hard work. The company and the experience, as well as the drafting, were very welcome. Then a week later over the bank holiday weekend I completed my May Super Randonneur series with a 400km ride. But this 400 was to be different from anything I had tried previously. As discussed in previous blogs, like many Audax riders I had always found 400km events difficult due to sleep deprivation issues and had found a solution that seemed to work very well for me. I had designed a 400km route that would entail riding 300km, sleeping at my house and then getting up after a few hours rest and riding a night time 100km local circuit. It had worked so well for me it had beaten my wildest expectations and so with this confidence about experimenting I decided to try two 200km circuits in a figure of 8 shape with my house as the pivot point control to allow me to benefit from a mid ride shower, hot food, change of clothes and even a sleep if I felt I needed one. I had even come up with what I considered quite a good theme for this 400km route. A northward circuit up to Upton on Severn. Then a southern night time loop, down to Downton. Unsurprisingly I called it, “Up to Upton & Down to Downton”. Again I decided to vlog it but this time in two parts (I’m still learning) so here is Part One with an un-camouflaged title reference to Alan Sillitoe and then Part Two. So, that was May and in June so far I rode a 200km DIY in Cornwall whilst on holiday for a week and then based a 300km DIY around a 100km calendar event I had ridden with a couple of Velo Club Walcot mates two years previously and had always wanted to re-visit. On June 18th I am down to ride a 600km DIY with a mate in a collaboration of routes and planning as we both came up with 300km circuits just as we had done in 2015. Then its another 400km to round off the month, although at this time I have not decided which route to use yet. Then on July 1st alongside many of my clubmates from Audax Bristol its off to ride the inaurgal 1000km Mille Pennines….